The blockchain currently stores many types of transaction information such as A to B transfer information, temporary information, and other information that is temporarily occupying a large space because there is no other place to store it. Commercial blockchain applications deal not only with transactions, but also the business system logic which requires more abundant data, such as resource text data, numeric data, video media data, etc., which are not stored on the blockchain. Sia is the earliest storage, bitcoin-based storage solution. Storj is similar to Sia in that it pulls data from a network disk. It does not provide program-accessible storage. The way to prove data integrity is by having the customer and the storage party sign a contract. Both sides are likely to be in this situation. Cheating becomes expected to provide proof of data storage. The protocol lab project first made the open source software InterPlanetary File System (IPFS), which positions itself as the infrastructure of the new transport protocol. The IPFS network is similar to the P2P network that existed ten years ago, such as eDonkey and Thunder. There is no incentive mechanism for the IPFS network, so the post-protocol lab has launched a new project called Filecoin to provide decentralized storage incentives. Lambda, however, is a program-accessible storage solution. Its underlying protocols utilizes a basic file system with object storage, Key-Value (KV) storage, and other storage types. It may be extended to provide more complex relational storage. Filecoin utilizes a more mature IPFS network. On this basis, the incentives will involve the consensus of the blockchain. Those who contribute more will be rewarded more and are imperative to prevent cheating. The most important thing in the blockchain space is that all participants can benefit and the benefits are directly proportional to the effort contributed. The blockchain is an economic model, not just a technical model. The two most important points of Filecoin are copy-proof and space-time proof. Filecoin started writing its whitepaper in 2014 and the consensus at the time was Proof of Work (POW) of Bitcoin. So in 2014, Filecoin focused on creating innovative consensus algorithms and their storage hooks which drive the technical solutions. The first is Provable Data Possession (PDP), which is not commercially available. Only cloud storage companies are using PDP, but there is no mechanism to enable users to prove that data storage according to customer requirements. The algorithm has been used in the field of decentralized storage, and the technology has developed very rapidly. The second is the Proof of Retrievability (POR), which is similar to the PDP and is more fault tolerant. Redundant backup is provided, and the storage space does not increase linearly according to the number of copies. At the same time, at a certain fault tolerance level, when some data segments become lost, the data can be restored according to other sectors. Finally, Erasure Code (EC) technology, which is similar to hardware RAID technology in traditional storage. These three technologies are vital technologies for decentralized storage. 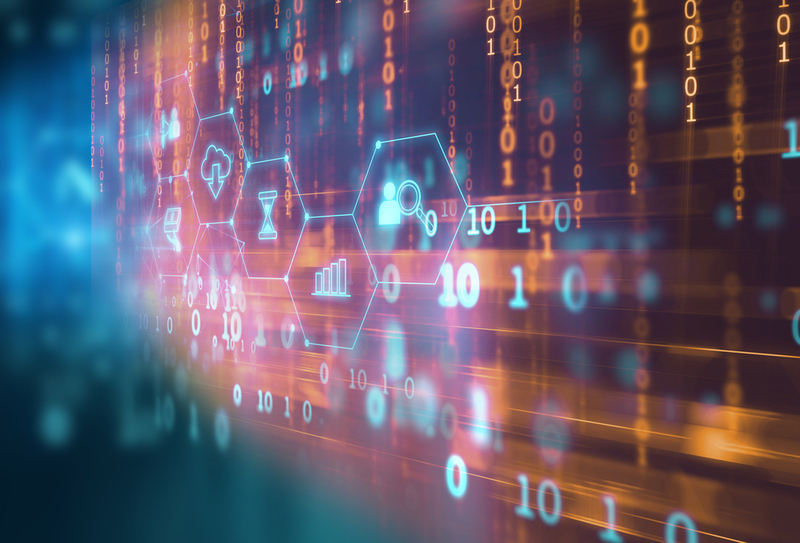 Proof of data integrity for blockchain storage solutions is a core issue that requires a solution. However, there is no complete solution at this time. The integrity of decentralized storage proves to be as complicated as blockchain information. While the data exists in the miner node, a corresponding mechanism is needed to detect whether the node stores the data. Filecoin’s consensus mechanism is Proof of Storage (POS), where the S is not a currency interest but rather how long and how much data the miner has helped customers. Storage is one of the most critical factors influencing the consensus, so Filecoin adds a series of additional anti-cheating rules to the storage certificate; this exponentially increases the difficulty of technical implementation. More so, it doesn’t help much in the POS itself as much as it adds to the fairness of the consensus. In a recent research study conducted between Filecoin and Lambda, data points show a significant plateau in Filecoin project development while Lambda’s grows notably in 2018. The chart examines Lambda and Filecoin’s launch, successful code tests, project development, and expected growth into 2019. 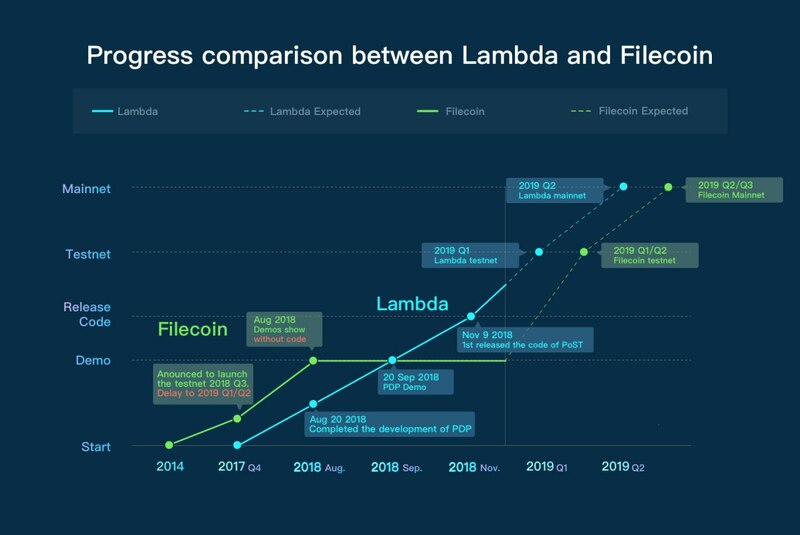 While both companies are expected to launch its main network in Q2 of 2019, Lambda continuously shows consistent growth and progress while Filecoin is delayed and currently shows no improvement. For the first time, Lambda provides the concept of a verification node in the field of decentralized storage. This is similar to the idea of third party administrator (TPA) mentioned in academic research. Instead of using one TPA node, Lambda created 1024 Validator position on the consensus network and used Verifiable Random Function (VRF) consensus mechanism to reach a verification result to the storage proof, which avoids the high risk of mutual cheating from both Storage and Verification nodes. Moreover, Lambda separates storage from its chain, which is more conducive to the upgrade and development of storage technology. The evolution of storage does not affect the transactions on the chain and is more conducive to the development and capacity expansion of the Lambda ecosystem. Lambda fully implements PDP, POR and EC technology, which significantly improves the security of decentralized storage. It also optimizes the storage space and traffic consumed by the algorithm to achieve the same level of secure storage. Lambda decentralized storage enables more secure storage at a lower cost. A small step in Lambda storage technology is a big step in the development of blockchain infrastructure. While each project has its own merits, the goal is always to employ unique protocols that provide robust storage capabilities. Recently, Ethereum World News reported on the launch of Lambda’s Proof-of-Space-Time verification which solves many of the limitations that exist in the PDP algorithm. Image courtesy of Shutterstock and Lambda.